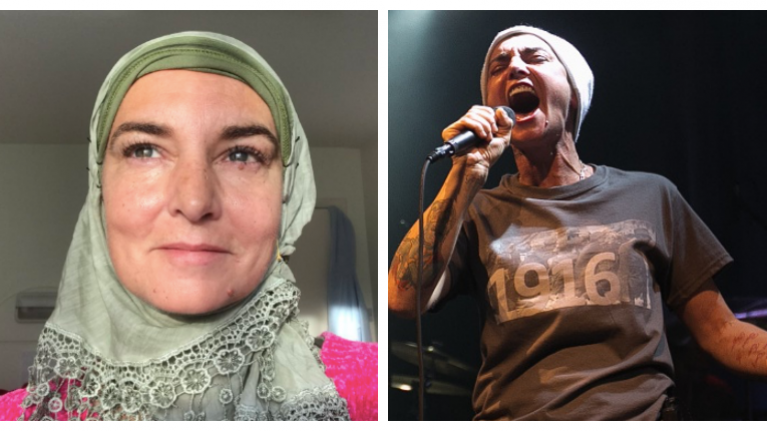 Outspoken Irish singer Sinead O'Connor has announced she has converted to Islam and changed her name to Shuhada. Having adopted the name Magda Davitt last year, the 51-year-old is now called Shuhada Davitt. She also changed her Twitter avatar to a black-and-white image of the Nike Swoosh logo and the slogan: "Wear a hijab. Just do it." "This is to announce that I am proud to have become a Muslim. This is the natural conclusion of any intelligent theologian's journey," she tweeted. "All scripture study leads to Islam. Which makes all other scriptures redundant. I will be given (another) new name. It will be Shuhada." Her Twitter account says the singer now lives in "Direland". O'Connor's 1990 hit "Nothing Compares 2 U" became a global hit, with her haunting voice, shaved head and single-tone outfits turning her into both an enigmatic and captivating figure. But her career began to falter after she tore up a picture of the late Pope John Paul II while appearing as a musical guest on US television in 1992. She said she was protesting sexual abuse in the Catholic Church, but her gesture was roundly condemned in the media and she was eventually forced to apologise. Yet her fight against the Catholic Church continued, and in 1999 O'Connor was ordained as a priest by a breakaway church based in the French city of Lourdes. Catholicism does not sanction priesthood for women. O'Connor told Billboard magazine in 2014 that she was still ordained but had stepped away from priesthood because "I'm not interested in causing more trouble than I already am".